Beginning with the minimum wage law in 1938 using the term growth is one of the biggest lies in economics that have ever been told. Sure, in a true free market place economy like before the 1938 minimum wage law the term growth meant real true growth. That is simply because it is impossible to have consumer inflation and a welfare state absent a minimum wage law. But, after the liberals enacted the 1938 minimum wage law what is now called growth is some kind of a phony blend of mostly inflation with hardly any real growth to speak of. And it's been that way ever since 1938. Today it takes $50.00 or more to buy what $5.00 would eighty years ago. Ain't no sense of me rambling on and on, I'll just get to the point one way or another our insane arch-evil 1938 socialist minimum wage law must go. If we don't do it ourselves soon mother natures supreme law of "Natural Selection" is going to do it for us. And that means totally collapsing the economy, period. I have been yelling out a primal survival stress call for many years now, what else is there to be done? Untold millions are going to starve to death. We have very little foundation like a strong nuclear and extended family system and an adequate supply of small farmers and home gardeners for emergency bartering capacity left to rebuild upon. A total USA economy collapse may set modern civilization back to the Stone Age, for real. SIRMANS LOG: 28 AUGUST 2016, 2209 HOURS. Because of its twenty-year anniversary I see the welfare debate is being tossed around. The blessing I have is I have the perspective and depth to see pass fog and bull and bore right to the heart of most problems. The first thing is if you don't understand human survival everything you say is empty rhetoric anyway. Anyone that has any knowledge of history should know that across all cultures one thing has been a constant for human survival for over six thousand years. This thing has proven itself to sustained life and has withstood the test of time. If you don't know what I'm talking about by now you don't have a true sense of history or what it takes for human survival, period. This thing I'm talking about is the "Nuclear and extended family system". There has never been a society in the history of mankind across all cultures that survived without a strong "Nuclear and extended family system" in place, period. Yet, the USA and Western Europe with their welfare states has left the traditional strong "Nuclear and extended family system" in almost total ruins. With that being the case hardly anyone is making sure proper norms and traditions is instilled in the very young. In far too many cases a strong male disciplinarian head of household is nowhere to be found. And even if a male is in the picture he is there for stud service at her whim. It is a waste of time talking about reforming welfare because it is just one more monster in our liberalism swamp. I can see right to the core of our welfare problem, and tell you the way to solve it. The best way is to kill two birds with one stone by starving the beast and draining the swamp. It is very simple; just repeal the arch-evil 1938 socialist minimum wage law, period. That act would starve the liberalism beast to death and drain the liberalism swamp all at the same time. If that happened it would also untie the USA economy and give it back its disciplining power and bring on a booming economy all at the same time. Otherwise, it will be impossible for the USA economy not to totally collapse soon. Don't take my word, any USA economist in private will tell you the same thing if he/she trust you. SIRMANS LOG: 21 AUGUST 2016, 1332 HOURS. Enough is enough, if congress is not going to repeal this evil 1938 law, me or someone must contest this evil law in court to the highest level, period. The 10th amendment is there for a reason; each state should have the power to set its own minimum wage law or if to set one at all. A minimum wage law gives the government total power over all property rights, all production rights, and all distribution rights. There is no greater governmental power on earth than to have a minimum wage law. Plus, it turns a free market place into a p.... economy with no power to discipline itself or to protect the country's culture and morals. 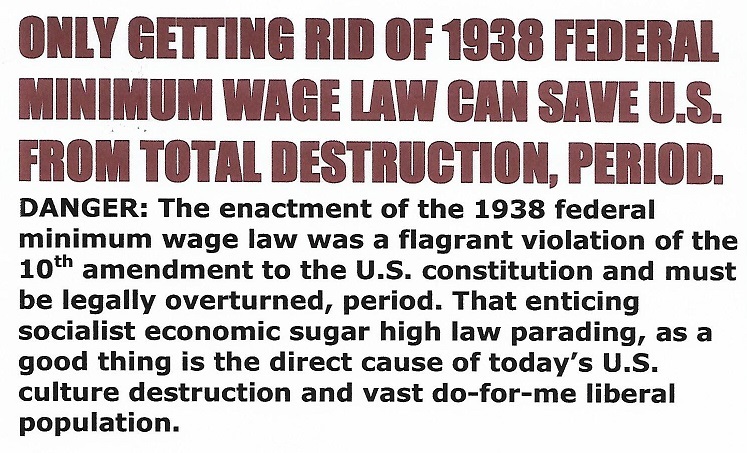 It is impossible to save the USA unless our evil 1938 minimum wage law is repealed. Only a genuine true free market place economy can save the USA from the liberals and total doom, period. And that can never happen with a minimum wage law in place. SIRMANS LOG: 19 AUGUST 2016, 1129 HOURS. One thing I have learned is individual freedom cannot exist very long without a non minimum wage genuine true free market place economy in place to maintain societal discipline, period. I hate to admit it but I believe after our November 2016 presidential election individual freedom in the USA will be lost forever. If the liberals win they will take over the U.S. Supreme Court. If that happens there will be no saving individual freedom, liberalism will have the final say on everything. It shouldn't take a rocket scientist to know that mass civil unrest will only be a matter of time and then authoritarian rule will become inevitable. God save the USA. The way this writer see it is when you have a corrupt anti-survival hostile liberal news media hell bent on destroying you: Damn the torpedoes! Full speed ahead! An aggressive, persistent, and determine person can never be counted out; unforeseen forces tends to come to the aid of someone like that. The last three republican presidential losers let the anti-survival corrupt liberal news media steam roll over them without even breaking a sweat. Not so with Trump, at least he will take them to the mat. SIRMANS LOG: 13 AUGUST 2016, 0917 HOURS. Always remember that Mother Nature leans toward creating and maintaining a balance in the universe. So, maybe that could be the role of Trump in the grand scheme of things. Something definitely needs to bring some balance to the totally out of control liberalism in the USA and Western Europe, period. Liberalism is a do-good weak shallow minded way of thinking in this writers view. But, the world would be a very dark dreary place to live without liberalism; it is the spice of life when kept in balance. However, with few exceptions they just don't have the depth to make the best leaders. Liberals will give away the store to grab and hold on power, especially if it's not their own to give away in the first place. Never in history has the poor ever been liberal until the welfare state came along and destroyed accountability and responsibility. I will explain liberalism in four words: "Lack of survival awareness". SIRMANS LOG: 12 AUGUST 2016, 1025 HOURS. Most liberals can't recognize or take a joke. I've said this many times and will say it again; liberals have a problem separating the real from the unreal, period. The fact is people with sound judgment and common sense doesn't have a big problem with Trump. Sure, common sense people disagree strongly with him, but they will never go into a frenzy. Trump sends liberals into a frenzy where they think Trump is in fantasy land when it is liberalism itself that is a fantasy land swamp. And for the umpteenth time I repeat that the only thing that can rein in liberalism and force it back under control is repealing our 1938 minimum wage law, period. Otherwise, nothing can stop liberals and liberalism from totally destroying this last bastion of individual freedom left in the world today. I write it as I see it, period. Most people know what happens when you dingle a cross in front of a vampire, well, Trump has a similar affect on most liberals. Now, only a fool or liberal would take what I just said as a fact of life. People are beginning to see liberalism as out of control in the USA. And I will go, as far as to say out of control liberalism is a greater threat to USA survival than anything I can imagine and I mean that literally. It must be brought under control if the USA has any chance of survival, and only repealing the 1938 minimum wage law can bridle liberalism, period. I have but one vote, which I will never use to aid a liberal take over of the U.S. Supreme Court. That is the USA number one problem now; liberalism has taken over damn near everything else already. And if they finally get control of the U.S. Supreme Court it will definitely be all over in terms of us being a free people and nation. SIRMANS LOG: 09 AUGUST 2016, 2316 HOURS. WHO GAVE THE LIBERAL NEWS MEDIA THE RIGHT TO PLAY GOD? Talking about scary and the nuclear button: I think what is far more scarier is the maximum volume of emotionalism that is being spewed out by the shallow minded liberal news media. This today's corrupt liberal news media is an insane mad-house of muck, negativism, and partisanship far above reason. It is like a tree-top wild fire, practically no one can stand up against it and survive, and especially those in politics. It scares me almost to death for my beloved country, sound judgment and common sense be damned. We have a down-right out of control anti-survival propaganda machine loose upon the land in my view. About this Trump thing: Whatever happened to allowing the voters to make up their own minds? What give the liberal news media the right to play God and demand for the people what is political correct for the survival of this great nation? Far too many republicans just don't get it, it is not just Trump, any republican nominee is going to be ripped apart by this anti-survival liberal news media propaganda machine even if they have to invent a reason, it is sheer madness. Don't insult my intelligence, I know right from wrong and my conscience will punish me if I knowingly do wrong. Since the come about of our liberal induced welfare state far too many people has a weak to no conscience at all. A strong conscience is something that has to be instilled when very young by means of a reward or punishment method. Love and praise acts as a reward whereas criticism and rejection acts as punishment to a child. But, when not abused, nothing instills a more strong and powerful conscience in a child than corporal punishment. "Spare the rod you spoil the child" is why we have so much more crime today than any time in history. SIRMANS LOG: 03 AUGUST 2016, 1202 HOURS.